Three years into the jobs recovery, most industries added workers to their payrolls between the second quarter of 2005 and the second quarter of 2006. Some industries stood out for both the absolute and percentage growth in their employment. Payroll employment data from the BLS identify these industries as construction, professional and business services, health services, financial services and food services.1 Job growth in those industries benefited most workers—Hispanic and non-Hispanic, native born and foreign born. 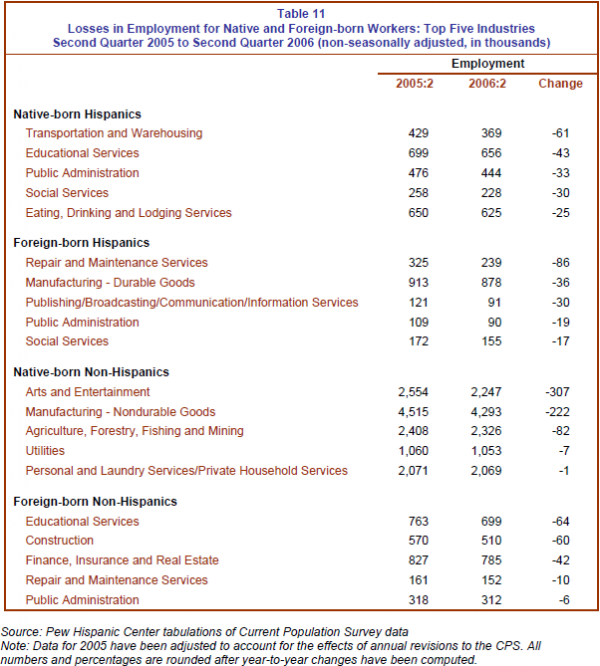 This section presents evidence on job gains and losses by industry for Hispanic and non-Hispanics workers from the second quarter of 2005 to the second quarter of 2006. Foreign-born Hispanic workers fared especially well in the construction industry. The construction industry, in fact, has played a vital role in employment growth for Hispanic workers for several years. A more detailed analysis of the role of construction in Latino employment trends is presented in the next section. For Latinos, construction, business and professional services, manufacturing, and wholesale and retail trade have been key employers. 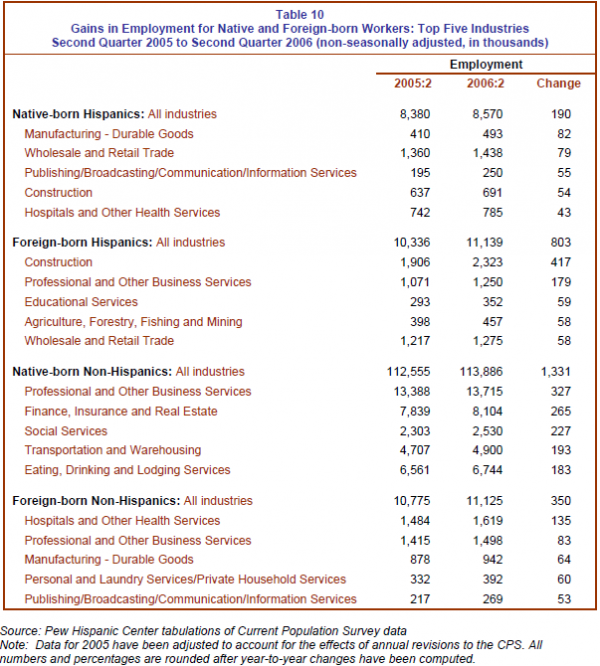 All of those industries added jobs between the second quarter of 2005 and the second quarter of 2006 (Table 10). In that time frame, most of the jobs gained by native-born Hispanic workers were in manufacturing – durable goods (82,000), followed by wholesale and retail trade (79,000), publishing, broadcasting, communication and information services (55,000) and construction (54,000). Foreign-born Hispanics had the most job gains in construction (417,000), followed by business and professional services (179,000). Together, those two industries accounted for almost three-quarters (74%) of all jobs gained by foreignborn Latinos between 2005 and 2006. The business and professional services sector, which ranges from management and technical services to janitorial, landscaping and waste management services, is also a key employer for non-Hispanic workers. Of the total increase in employment in 2005-06, non-Hispanic workers accounted for 410,000, native-born workers 327,000 and foreign-born workers 83,000. Other important sources of new jobs for native-born non-Hispanic workers were finance, insurance and real estate (265,000) and the social services industry (227,000). For foreign-born non-Hispanic workers, employment growth was also strong in hospital services (135,000) and manufacturing – durable goods (64,000). Job losses were scattered across a variety of industries (Table 11). In absolute numbers, the most significant losses were among native-born non-Hispanics in arts and entertainment (307,000) and manufacturing – non-durable goods (222,000). Other sectors that shed a notable number of jobs ranged from transportation and warehousing (native-born Hispanics) to repair and maintenance services (all foreign-born workers) to educational services (native-born Hispanics and foreignborn non-Hispanics). In the public administration sector, there were job losses for all groups except native-born non-Hispanics.